Don't be alarmed by the name Playa de los Muertos, the Beach of the Dead. Everything here is alive and well, starting with an underwater world full of life. The coastal area of the Cabo de Gata nature reserve is well protected and has kept its natural beauty. Playa de los Muertos is right below a cliff and can only be reached by foot. The small path leading to the beach can be somewhat tiring, especially under the scorching noon-time sun, so you'll need a bit of motivation to get you through the 10-minute walk. But once there, you will have arrived in a natural paradise... So natural that swimming naked is welcomed! Playa de los Muertos is vast beach, extending over a kilometre along the Mediterranean Sea. The beach is 1160 metres long and 30 metres wide. It is well protected because of the coastal mountains. 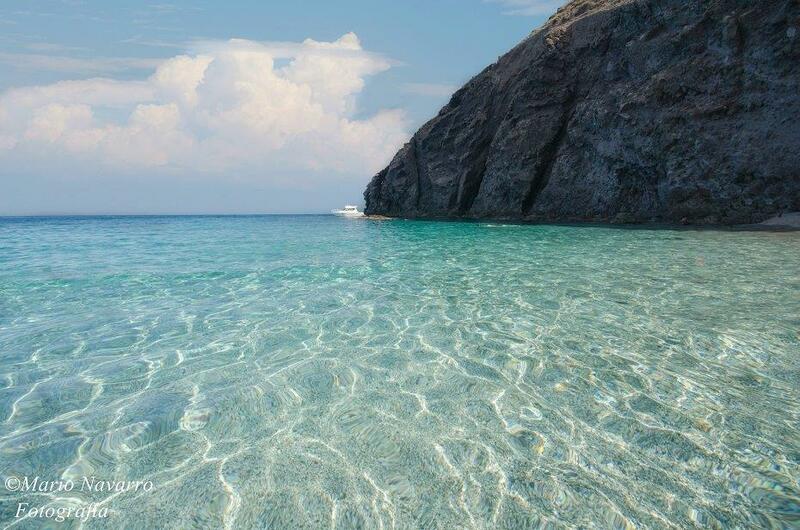 Nowhere is the sea so clear and blue as it is here, with the sand becoming increasingly finer the closer you get to the water. 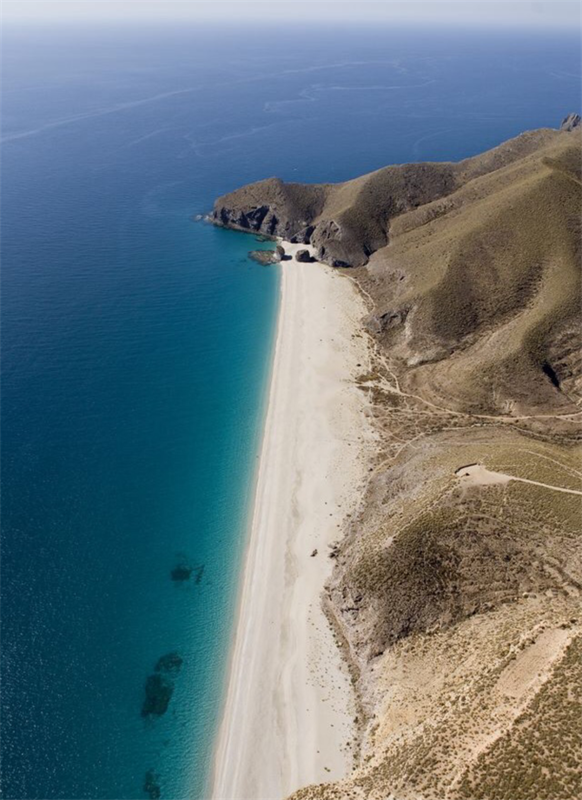 This is one of the most beautiful Andalusian beaches in Spain, and a prominent image of most Almería postcards. If you want to save the walk down to this paradise for another time, think about using a kayak to access Playa de los Muertos from the next beach over, which is next to the power station. Why the Beach of the Dead? It is said that in the past many sailors who were washed away on stormy days reached the shores of this beach due to the strong currents that meet here. This is sad fact to remember, but it is a story of the past. Today the area is monitored by a coast guard and these types of tragedies are avoided. Playa de los Muertos is a totally natural place, with no services offered at the beach. Remember to bring everything that you may need for a day at the beach. Don't forget water, food and your snorkelling kit: mask, snorkel and fins. Bringing a parasol, or at least a hat, is a good idea too. Water clarity here allows swimmers to discover interesting rock formations and the wonderful marine life. During high season you can sometimes find ice cream carts, drinks and snacks along the beach. Getting to this beautiful beach can be difficult for young children and those with difficulties walking. There are two small trails leading from the AL-5106 road and the tourism office. The first path is slightly longer (700 metres), but more manageable. The second way is shorter (100 metres), but much steeper. Look out for signs for Playa de los Muertos, Faro de Mesa Roldan and Cabo de Gata Nijar Natural Park. Along the road towards Carboneras there is ample parking space for cars on both the right and left side of the road. The cars are fully exposed to the sun, but it is a safe place to park and is guarded in midsummer. Nevertheless, you still shouldn't leave valuables in the car - take them or at least stow them away in the trunk. The fishing village of Aguamarga with its beautiful beach is worth a visit. 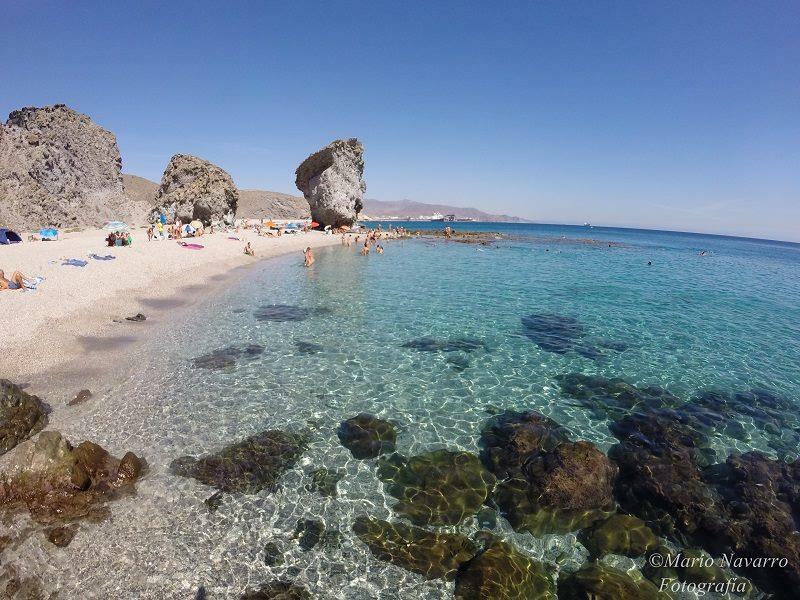 It takes you through the heart of the Natural Park of Cabo de Gata to reach Playa Monsul and Playa de Los Genoveses. The El Faro de Mesa Roldán lighthouse is past Aguamarga on a volcanic mountain that is full of fossilized seashells. It is right next to the parking area for Playa de los Muertos. The fiesta village of Mojácar is located along the coast at just a 50-minute drive. The AL-5106 road is one of the most spectacular on this coastal stretch from Carboneras to Mojácar. The views are stunning. 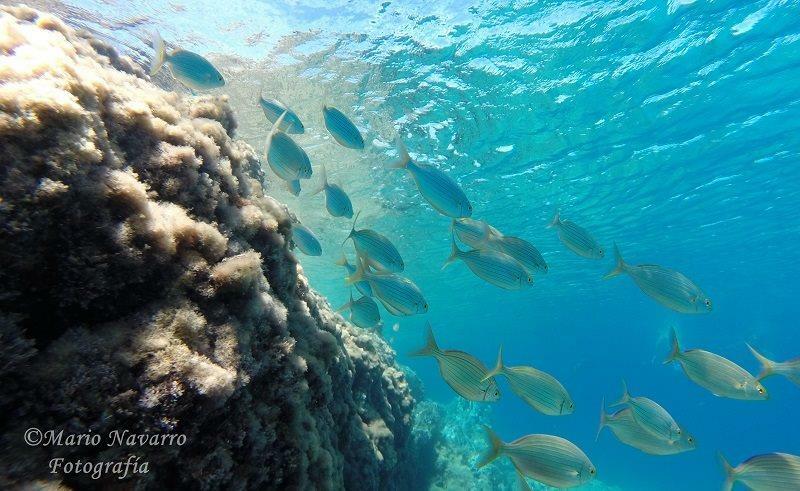 * Thank you to Spanish photographer Mario Navarro from Águilas for these beautiful beach images, especially the incredible underwater photographs. A weekend afternoon in Cabo de Gata, out of season but definitely in fashion for walkers and birders alike.